. . .hat she thought our talk might end. But I did not mean it to end like that. "For good?" said I. "No! . . Nettie! Nettie! You don't mean that!" "I do," she said deliberately, still looking at me, and with all her pose conveying her finality. She seemed to brace herself for the outbreak that must follow. Of course I became wordy. But I did not submerge her. She stood entrenched, firing her contradictions like guns into my scattered discursive attack. I remember that our talk took the absurd form of disputing whether I could be in love with her or not. And there was I, present in evidence, in a deepening and widening distress of soul because she could stand there, defensive, brighter and prettier than ever, and in some inexplicable way cut off from me and inaccessible. 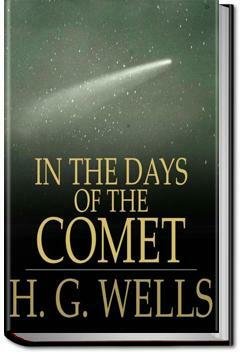 In a time of war and financial chaos, a comet moves through the Earth’s atmosphere and releases a green smoke. It renders every living being unconscious, but when man awakes he finds that he has lost the capacity for rage, fury and the darker passions. A utopia is then built. Wells was a Fabian socialist and pacifist who devoted much of his work both in his fictions and non-fictions towards educating people. In the Days of the Comet he presents a thought-experiment: What if everyone became rational? In literary terms Utopia has never quite been much cop. What an odd little book. I was surprised to see that Wells wrote this later than all his other famous, hyper-influential SF novels, because it reads more like an early failed experiment, but it sure is interesting.